These smörrebröd are perfect for lunch or as a starter. These pieces are part of what we serve when celebrating Midsummer or Xmas. The difference is that we at Midsummer and Xmas don’t settle with one snaps. Mix all ingredients with a spoon. Spread it on a plastic wrap and roll it to a cylinder. Put in the freezer for half an hour. It is then easier to cut into nice pieces. Serve with cucumber, dill and some lemon. Mix all ingredients in a blender. Serve with some pumpernickel or crisp bread. Chop everything into fine pieces and mix with a spoon. Serve with pumpernickel or crisp bread. 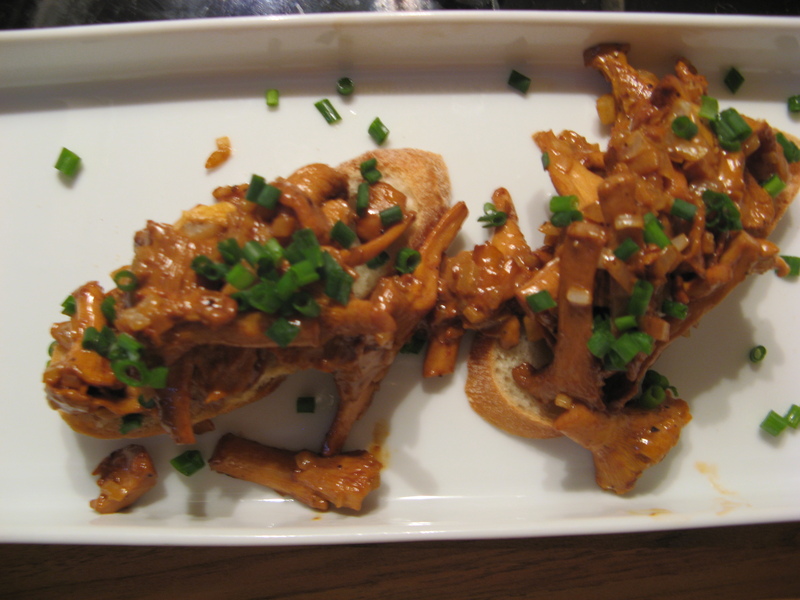 As a starter we made a very easy but oh so delicious chanterelle sandwich. Clean the chanterelle and put them in a heated pan, fry them until most of the fluid is gone then add butter, half an onion finely chopped, salt and black pepper. Finally pour 4 tbsp double cream into the pan and let it simmer for a couple of minutes. Put the fried chanterelles on top of a slice of really tasty bread. Sprinkle chopped chives on top. 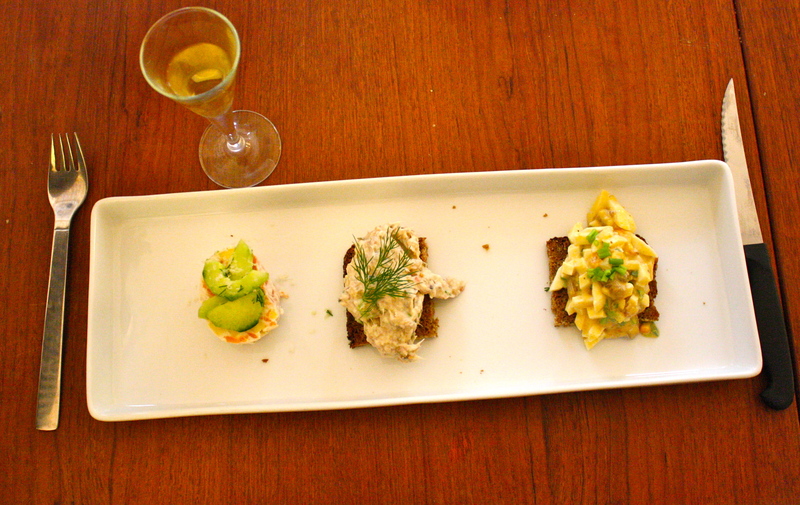 After eating a whole lot of Asian food, which we love, we decided to go crazy with the Scandinavian food this week. Use a food processor and mix the fish together with the egg until the mixture has a good consistency. Add salt, pepper and chopped chives and stir everything together. Make four burgers out of the mixture. Fry the burgers in butter. Pour the sour cream in a small bowl, add the chopped dill and the peeled and chopped shrimps. Flavor the sauce with mustard. 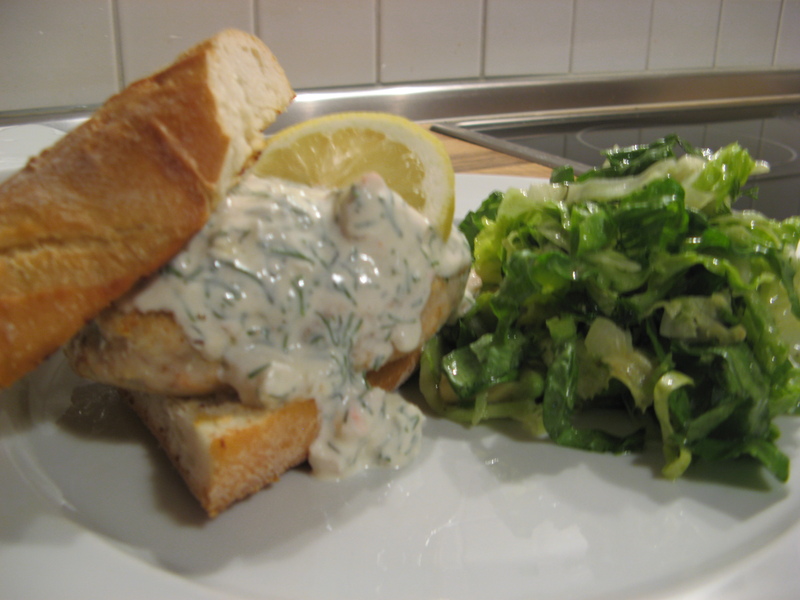 Serve the burgers with a tasty bread, for example Ciabatta or baguette, and add a slice of lemon for the burger. We also made a salad with cucumber, avocado and Romain lettuce with a nice mustard salad dressing. Many friends of mine do not understand the greatness of cod. The reason is that we Swedes have grown up with over cooked cod served for lunch in school. If you can get hold of a thick cod loin I promise you, you’ll change your mind about this culinary treasure. 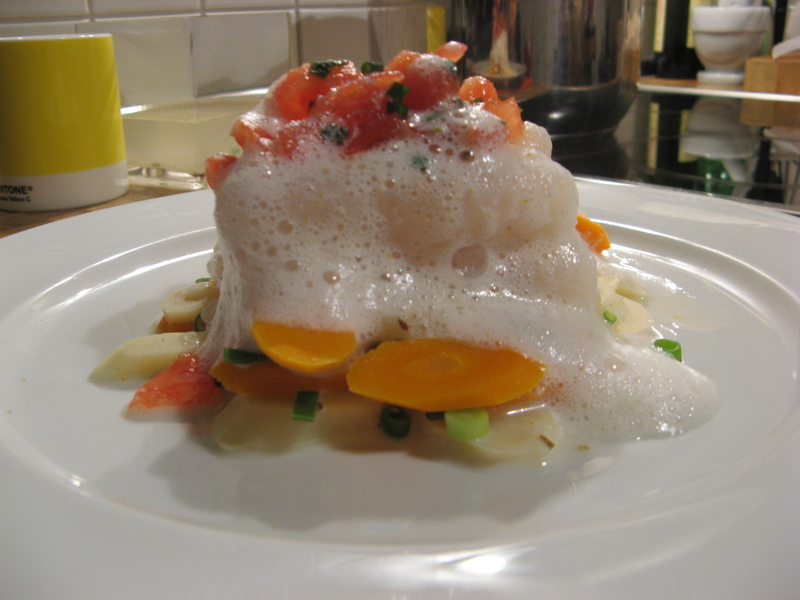 This is an easy recipe that will get you many compliments – Cod fillets with lemon flavoured vegetables and foam from heads of dill. Make four pieces out of the cod and put it in salted water for 15 min. Wipe the cod dry with a piece of kitchen paper, put the pieces on oven paper and bake it in the oven at 100⁰C until the fish temperature reaches 45⁰C. It takes about 10-15 min depending on the thickness of the fish. Slice the parsnips and carrots in to roundels (3 mm thick). Braise the vegetables in lemon juice, a pinch of salt and sugar, water (just enough to cover the veggies) and the cream. When the veggies are al dente, add chopped spring onions and pour out the fluid. Use a strain, that is the easiest way. Pour the milk, heads of dill, salt and pepper in a saucepan, heat it until it simmer. Take the saucepan off the stove and mix the fluid to a foam with a hand blender. Peel the tomatoes, remove the core and cut the tomato flesh into small pieces. Mix it with chopped chives and a pinch of salt.